It's cuttin' loose for some summer fun time. 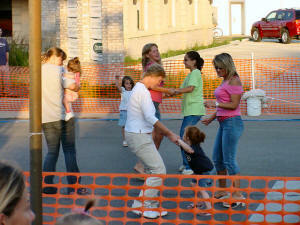 Dancers hit the streets when "Vintage Daze" heated up the Lincoln Heritage Days Celebration on Friday evening. "Imagine That" followed on rock night. Tonight's is country with the "Saturday Nite Special" followed by "Chillbillies." Afternoon in Scully Park features a community garage sale, kids music and games and a water melon feed; while a car cruise-in takes place on the square. Friday through Tuesday: See the Lincoln Heritage Days schedule for details of five more days of celebration, including two evenings of downtown street dances and food, kids meet Abe through stories, sidewalk sales, garage sale in the park, watermelon feed, car cruise-in, cookout, outdoor movie, water games, fireworks, and much more. Saturday: And/or take in the quieter country side this weekend at the Chestnut "dinner and a movie." And/or make a trip for fresh goods from Elkhart's farmers' market. Sunday: City of Lincoln's kickoff of the Abraham Lincoln Bicentennial observance, "Live the Legacy." Monday: Remember to give blood.